Starring: Dwayne Johnson, Carla Gugino, Alexandra Daddario, Ioan Gruffudd, Archie Panjabi, Paul Giamatti, Hugo Johnstone-Burt, Art Parkinson, Will Yun Lee, and more. 1) Acting - Total Thumbs Up: Dwayne Johnson has always been able to pull the heart strings or say any number of cliches or silly things with a straight face. Both are great skills to have in disaster movies, so he was a good pick. Carla Gugino as Emma was also a great choice. Alexandra Daddario, Hugo Johnstone-Burt, and Art Parkinson were adorable and worked quite well together. Paul Giamatti and Ioan Gruffudd always do great work and their performances during this film are no exception. 2) Special Effects - Total Thumbs Up: Special effects are one of the main ingredients for a great disaster movie. "San Andreas" had them in spades. Several of the earthquakes scenes were just amazing! Watching the waves of force ripple through the land will give you chills. The giant crack after one of the earthquakes was jaw dropping. A great bit to bring home just how vast the reach of this thing was. What really sold the film, however, were the special effects that were up close and personal. A multitude of gags happen right beside you, making them immediate, devastating, and shocking. The way they were handled made the moments more poignant than usual, which only added to the realistic feel of the disaster and the immersion of the audience into the story. There are a multitude of iconic moments. And they run the whole gambit - falling buildings, out of control fires, tsunamis, death by cruiseship, death by buildings, possibly even death by a kitchen sink. The special effects people also had some great fun with helicopters and planes! 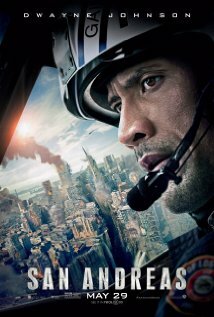 3) Plot/Story - Thumbs Up: Disaster films tend to be formulaic by nature. "San Andreas" is no exception. But I will say it came across a little more creative and believable than some. The people they gave to cheer for were likable, and also ratcheted up the anticipation as they gave us others to get excited about in just how they'd get their 'just desserts'. 4) Stunts - Total Thumbs Up: Though some of the stunts involved CGI, many did not. Between all the shaking and the rolling, the stunt people were kept quite busy. Great job guys! 5) Locations/Cinematography - Total Thumbs Up: Some lovely sweeps of LA and San Francisco tantalize the audience before disaster strikes. An easy way to make the destruction have more impact. The disasters were filmed from all angles - from the air, from the ground, from the water - immersing the audience completely in the story being told. Conclusion: If you're a fan of disaster films, this one is definitely worth putting on the list to watch. The visuals are great! All the right components are there, and the personal drama, and even a budding romance, worked well within the film.